TORONTO -- Doug Ford is emphasizing campaign promises to put money back in taxpayers' pockets as his Progressive Conservative caucus meets for the first time since winning a majority in this month's election. 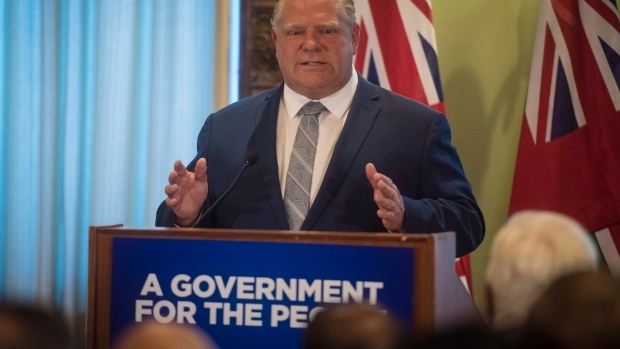 Ontario's premier-designate began Tuesday's meeting by repeating election pledges and specifically mentioned his plan to roll back the provincial portion of the tax on gas. In a short speech to an enthusiastic Tory crowd, Ford recapped some of steps taken by his transition team, including last week's announcement that he would scrap Ontario's cap-and-trade system. Ford did not, however, mention a hiring freeze and limits on discretionary spending he ordered this week. A memo posted on the government's website says the hiring freeze excludes essential frontline staff such as police, corrections and fire services, as well as lateral moves within the public service. The NDP, who will form the official Opposition, expressed concerns Tuesday about the lack of details on the hiring freeze and the possible impact on health care and education. "I'm requesting that you immediately provide a detailed and specific list of what positions you have deemed as essential frontline staff for the purposes of this freeze," NDP Leader Andrea Horwath wrote in an open letter to Ford.